Between 1964 and 1966, Andy Warhol shot close to 500 short movies of friends, celebrities, models, and any of the other lovely young things who passed through his studio known as The Factory. The indie-rock duet Dean and Britta recently composed songs for 13 of the videos, which they've been performing live as part of a multimedia concert for several years. "13 Most Beautiful... Songs for Andy Warhol's Screen Tests" is available on DVD, CD, and of course, YouTube. We especially loved "I'm Not A Young Man Anymore," featuring an icy cool Lou Reed, so hip and desirable that even his Coke bottle looks as if it's wearing sunglasses. There are other gems as well, starting with the doomed Edie Sedgewick, one of The Factory's earliest stars, who died of an overdose in 1971. The 5'10" German model Nico, before she began recording with the Velvet Underground. The preternaturally beautiful Paul America, star of Warhol's film "My Hustler," who eventually hired lawyers to seek payment for his role in the movie that made him a reluctant gay icon. He died after being hit by a car in 1981. And finally, the late Dennis Hopper, extraordinary on screen even by Factory standards. According to Dean and Britta, he was the first to buy one of Warhol's soup can paintings. On a somewhat unrelated note, the Dean is of course Dean Wareham of Galaxie 500 and Luna. If you're a fan of his music, or even just nostalgic for 90's era pre-Napster indie rock, you might want to check out his dry, thoughtful memoir, Black Postcards: A Rock & Roll Romance. This past February, Randy Halverson ventured forth into the frigid South Dakota night to create a painfully pretty time-lapse film. He called it "Sub Zero," an apt title given that temperatures fell to -25 degrees Fahrenheit. With the approach of spring, Halverson returned to the great outdoors to shoot "Orion," which features constellations tracking across his family farm. The film starts in an old grain distillery, then moves outside, and gets downright mesmerizing around the 1:45 mark. In case you're wondering, the film doesn't take its name from the Orion constellation. Rather it comes from the Orion telescope head used to shoot the film. That gear appears at the 2:09 mark. Sit back and enjoy Candaş Şişman’s video dedicated to the influential Turkish sculptor, İlhan Koman (1923-1986). Rodin, Giacometti, Brancusi – they all informed Koman's work, and now filter back into Şişman’s video installation, which went on display at last year's Hulda Festival. The festival, featuring Koman’s scientific sculptures, ran from March 2009 until November 2010, and traveled to Stockholm, Amsterdam, Antwerp, Bordeaux, Lisbon, Barcelona, Naples, Malta, Thessalonica and finally Istanbul. You can find more of Şişman’s work on Vimeo here. You want to know why Rupert Murdoch runs the world and you don't? Here's a hint: In 1990, Spy Magazine (now archived at Google Books) sent Murdoch and a slew of other wealthy celebrities checks for $1.11 as a prank. Murdoch cashed his right away -- because even when he was just a lowly billionaire, the guy understood money. 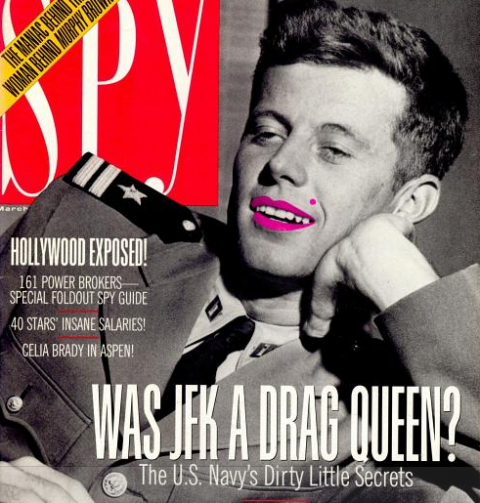 And the editors at Spy (1986-98) understood celebrity culture, which is why they became arguably the most influential magazine of the late 20th century, or, in Dave Eggers' words "cruel, brilliant, beautifully written and perfectly designed, and feared by all." Combining an elegant house style, barbed satire, and a healthy dose of class-rage, Spy inspired a radical tonal shift in American journalism just in time for the arrival of a perfectly suited new platform: The Internet. And that's without even starting on the true classics from the 80's. It's all at Google Books. Enjoy. We giddily present "Jersey Shore" Gone Wilde, as performed by the cast of The Importance of Being Earnest, a production currently being staged by the Roundabout Theatre Company in New York City. Go ahead and catch this inspired mashup of Victorian comedy and MTV "reality" at Playbill Video in 5 parts ... unless you have work to do this afternoon. The central intelligence of ants – the way ant colonies organize themselves without a leader and get things done – continues to amaze scientists and science writers alike. Back in 2003, Deborah Gordon, a Stanford biologist, gave a whole TED Talk called “How Do Ants Know What to Do?," which sheds light on how ants can form stunningly complex, leaderless systems. Then, several years later, RadioLab continued to mull over Gordon's fascinating research in one of its very first episodes. Now we get this great bit of video. It comes to us via researchers at the Georgia Institute of Technology, and it shows how ants, when placed in water, can form a completely watertight raft in under two minutes. "They'll gather up all the eggs in the colony and will make their way up through the underground network of tunnels, and when the flood waters rise above the ground, they'll link up together in these massive rafts," says Nathan J. Mlot, an engineering student involved in the project. Amazingly, even the ants at the bottom of the raft never get submerged. They all survive, which raises the question: Can this research lead to new floatation devices for the rest of us to use?